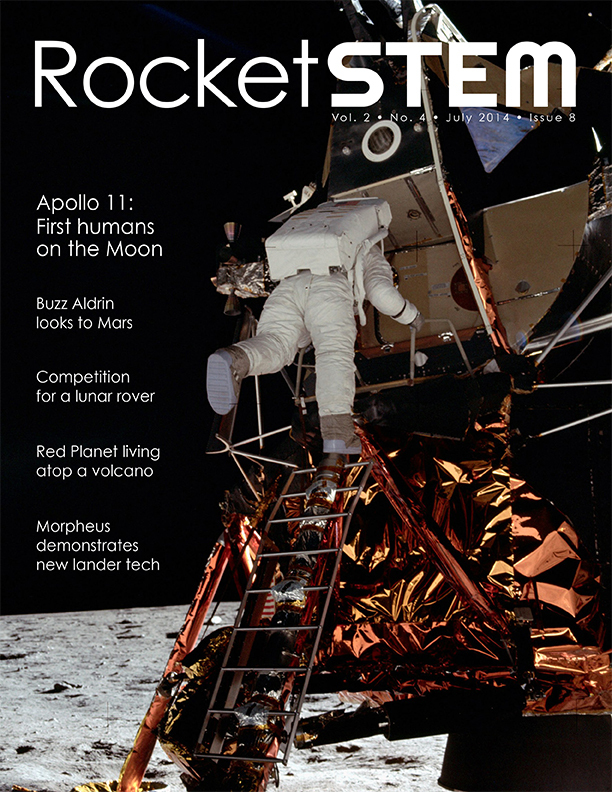 Join us in this special supersize issue of RocketSTEM as we celebrate the 45th anniversary of the Apollo 11 Moon landing. We’ve got you covered with an expansive pictorial featuring many of the lesser known photos from the historic mission, as well as a number of anecdotes from those who were involved in the massive undertaking. Astronaut Buzz Aldrin shares his thoughts on the Moon landing and the events leading up to the mission, as well as his hopes to colonize Mars in the coming decades. We also speak to Jack King, the man known the world over as ‘The Voice of Apollo.’ We travel to Morehead Planetarium and learn how the early astronauts would travel there to learn to navigate by the stars. We take you behind the scenes of the Apollo space program and meet some of the unsung heroes of the race to the Moon. But this issue is not all about Apollo. We bring you stories about the Morpheus test lander, the Google Lunar X Prize and one college team hoping to win the $20 million prize. We give you advice on observing and photographing the Earth’s nearest neighbor, the Moon. We go high up on the slopes of a Hawaiian volcano to discover a group of adventurers who are simulating a four-month stay on the Red Planet. NASA Administrator Charles Bolden updates us on the future of America’s space program, and we check out the latest progress on commercial crew efforts by Boeing and SpaceX. All this, and more, in the latest issue of RocketSTEM! 02 Project Morpheus As a test bed of technology for future landers, Morpheus has proven successful. 24 Jack King ‘The Voice of Apollo’ has seen it all during his years at Kennedy Space Center. 28 Unsung Heroes Working behind the scenes were many heroes of the Apollo space program. 40 Apollo 11 In July of 1969 the world watched as the first men landed on the Moon. 72 Buzz Aldrin He walked on the Moon and now he is working to establish a colony on Mars. 82 HI-SEAS 2 Adventurers simulate living on Mars within a habitat on the slope of a volcano. We’ve been asked about purchasing printed copies of this magazine in the past, and we are happy to announce that a limited number of high-quality printed copies are available for this issue. If interested, please visit www.rocketstem.org/purchase to reserve your copy now. While there, also consider signing up to be notified should we begin offering an annual print subscription in the coming months. Since founding RocketSTEM in late 2012, we’ve stated that each issue of the magazine will be FREE to read online. As a non-profit organization that is a mission we intend to never stray from, however, that is not to say that funding such a publication is not costly. Getting material from RocketSTEM used in classrooms is a top priority, therefore we have never sold advertising space in the magazine, as some schools would frown upon doing so. If you would like to help us continue our mission, please consider making a donation to RocketSTEM via our website at www.rocketstem.org/donate. Donations can be made online via PayPal to donations@rocketstem.org, or can be mailed to: RocketSTEM Media Foundation, P.O. Box 34409, Pensacola, FL 32507. Thank you for your support.